Two common reasons people don’t come to the dentist is fear and embarrassment. Your fear of pain is unfounded. People who worry that dentist visits lead to pain are basing their anxiety on misinformed knowledge. Most routine dental visits are painless, thanks to modern techniques in a dental practice. Regular visits to the dentist make it less likely that you will need any major dental procedures. Once you realize that dental appointments involve routine dental exams, you will throw away and anxiety prior to dental appointments and go through the visit with a smile. There is no need to be embarrassed in front of your dentist. Allowing someone to examine your teeth and mouth requires you to trust your dentist and have confidence in your dental hygiene. If you have either a cavity or a toothache, it is important that you are honest so that an appropriate solution can be reached before the situation becomes painful. The best way to overcome dental anxiety I to talk to your dentist and you will discover that you have many reasons to smile and none to worry. 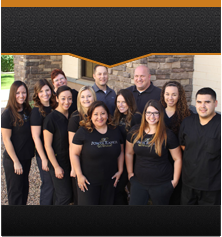 Come schedule an appointment to see local dentists at Power Ranch Dental!